Description	 MS in Greek on papyrus, Alexandria, Egypt, 3rd c. BC, 2 fragments from 1 column of a scroll, 5x4 cm and 4x5 cm, (original column width ca. 12 cm), 13 lines in a fine regular Greek uncial. 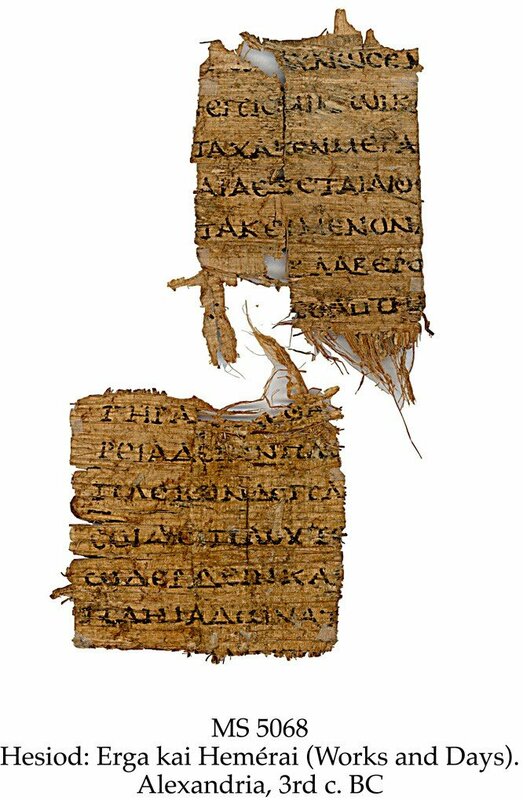 Context	 Roger Pack, The Greek and Latin literary texts from Greco-Roman Egypt, 1967, lists only 5 known ancient MS fragments of Works and Days, the earliest dated to 1st c. AD. For a complete MS of Works and Days, see MS 593 (15th c). Provenance	 1. Possibly copied from an exemplar in Bibliotheca Alexandrina (3rd c. BC); 2. Private collection, Switzerland (1965-1999). Commentary	 This is by far the earliest surviving MS of Hesiod's poem, and also one of the earliest MSS of Greek literature. Hesiod (ca. 700 BC) was, after Homer, the earliest and most popular epic poet in Greece. In line 363 the present MS has a textual variant not recorded elsewhere. Published	 Papyrologica Florentina, vol. XXXV. Rosario Pintaudi: Papyri Graecae Schøyen. Firenze, Edizioni Gonnelli, 2005 (Manuscripts in The Schøyen Collection V: Greek papyri, vol. I), pp. 27-28.